I initially thought this recipe was going to be a complete pain, brownies from scratch. Why even does that anymore? However, I was quickly surprised at how easy this was, and just how adaptable it is as well. I love my grandmother to death, but the woman didn't like chocolate. Which makes it odd that 1) this recipe is in her box, and 2) that she was so known for her German Chocolate Cake. I specifically remember her saying that Reese's were ruined by the chocolate. I on the other hand live for the peanut butter chocolate combo. 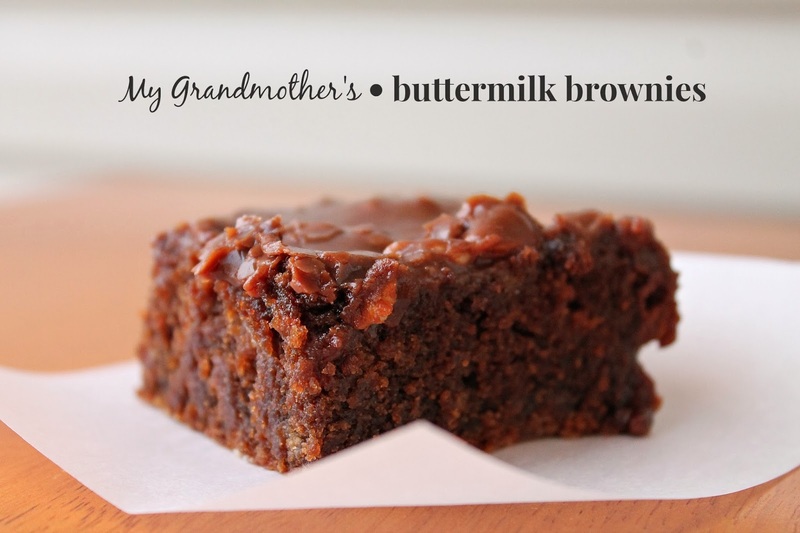 Before making this recipe I called Mom to see if she remembered it, I sure didn't. She said Nanny made it every once in awhile, but not often. This had to have been something she made for Pop, who like me does not judge a dessert. We love all desserts. 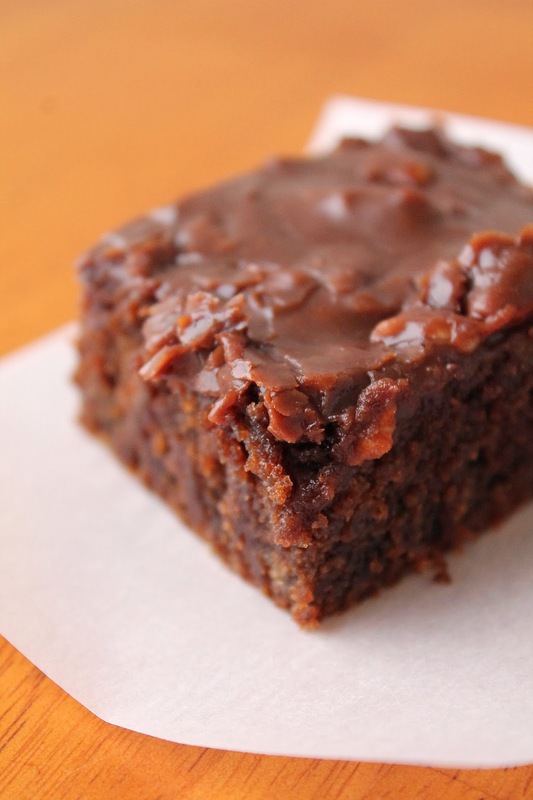 It's hard to say what the best part of this recipe is, the actual brownie or the frosting. After licking both bowls I am positive they are equal in their amazingness. Sift flour into a large bowl. Add sugar and salt. Mix. Combine butter, water, cocoa, and oil in a saucepan. Bring to a boil. Pour over flour mixture. Add buttermilk, eggs, baking soda, and vanilla. Stir to combine. Pour into greased and floured 11x16x1inch pan. Bake 20 minutes at 400. I didn't have that size pan for I used a 13x9 and baked for 25 minutes, it also makes for thicker brownies. Combine butter, cocoa, and buttermilk in a sauce pan. Bring to a boil, remove from heat, add other ingredients. 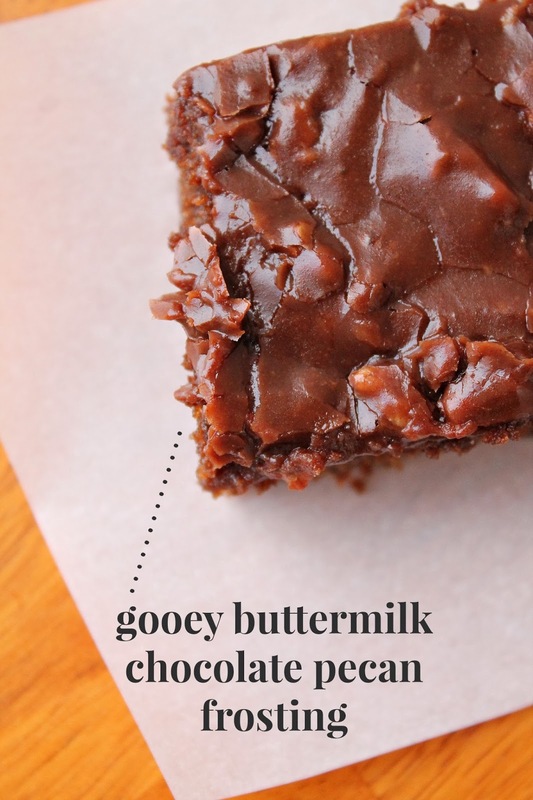 Spread on brownies while brownies are hot. Now I'm going to go walk the dog so I am not in the same room as these things.